Our year kicks off with an overview of AFP benefits, insider advice for obtaining your CFRE and other certification, and extra networking time. This is the first time in the history of America where there are four generations in the workforce. The impact is tremendous, different work ethics, communication styles as well as workforce expectations. The participants can expect to learn how to lead, communicate with and develop strategies around these differences. Ronald Harris serves as the Director of Workforce Diversity at BlueCross BlueShield of Tennessee. In this capacity, Mr. Harris provides strategic leadership and counsel for diversity initiatives within the organization that include diversity awareness training, recruitment, employee development, supplier diversity, and community outreach. He also ensures adherence to the Office of Federal Contract Compliance Programs, Equal Employment Opportunity, Affirmative Action Plan and Title VI of the Civil Rights Act of 1964. Mr. Harris is a regular speaker at business functions and conferences throughout Tennessee and the country on diversity topics that impact the workplace. Subject matter that is covered includes: generational diversity, disability awareness, stereotypes, effective cross-cultural communication, religion in the workplace, the business case for diversity and others. If we all worried about the technical aspects of CGA’s , CLT’s, CRT’s and other types of planned gifts, there would be very little time to cultivate, solicit, and steward the planned gift donor. This session will explore the layperson knowledge necessary for building successful planned gift programs and, most importantly, how to know when to leave the technical details to the professional advisors! Learn to focus on the needs of the donor and understand what they wish their legacy to be for family, friends, and favorite charities. We will also discuss the attributes of planned gift donors and why they are not on the radar screens of most development professionals. Come ready to learn and share about helping donors make that “ultimate gift” for the benefit of future generations. Mark has more than 30 years of fundraising experience previously as Vice President, Development for Children's Healthcare of Atlanta (the former Scottish Rite and Egleston Healthcare systems). As such, his responsibilities included planned giving, major gifts and strategic leadership for marketing philanthropy to various community constituencies. His other healthcare experience includes serving as the Chief Development Officer at Piedmont Hospital in Atlanta. He has also served as Chief Development Officer for the International Life Sciences Institute and as Executive Vice President of Phi Gamma Delta Educational Foundation. In 1983, Mark received his B.S. from the University of Vermont. He has served as President of the Atlanta Peachtree Rotary Club. He is a member of the Association for Healthcare Philanthropy (AHP), and other memberships and volunteer experiences have included: the National Committee on Planned Giving (NCPG), the Georgia Association for Development Professionals (GADP), the Georgia Healthcare Association (GHA), and the Atlanta-area University of Vermont Alumni Association. Additionally, he has served on the Advancement Council for Mount Pisgah Christian School. The field of donor relationships is experiencing a revolution unlike any seen before. Communications are no longer segmented, stark, and costly mailings; now we are looking to create rich, bold, all-encompassing communications that grab and engage donors and prospects. The real value of this new paradigm, however, is in the genuine, authentic conversation that exists. What sets the high-achieving shop apart is its ability to take calculated risks, embrace failure, and innovate. Let’s walk through this changing landscape together and learn how to move forward and inspire others to join our mission of innovation and the future of the next best practice. Lynne Wester is a frequent conference speaker and well known resource for donor relations and fundraising expertise. She has been featured in The Washington Post, CURRENTS magazine, The Chronicle of Philanthropy and other industry publications. Lynne created this website and blog to share her expertise, opinions, and collections of samples on a variety of topics with the greater development world and hosts a monthly webinar series. It is her personal philosophy that the goal of any great fundraising operation is to use strategic communications and interactions to foster the relationship between the organization and its constituents and friends. If we are effective with that strategy, they will be engaged in a way that drives them ever closer to embracing the organization's mission and values, they will give their money, time, and talents and volunteer to spread that same message with others, which will encourage their fellow peers to invest in a way that will enable the organization to further light the world. Using her expertise and hands-on approach, Lynne works with organizations to help them keep their focus donor driven, technology savvy, strategic, and always with a splash of good humor. She received her undergraduate degrees from the University of South Carolina and is a loyal gamecock alumna, donor, and fan, and holds a master's in strategic fundraising and philanthropy. How many development directors have you had to hire? How long do they stick around? How often have you felt frustrated with the options for development hires - or development jobs? Join us for this session where we explore the 5 biggest mistakes organizations make in hiring for development positions - and share practical tips and tools that solve all those problems, to make sure you end up with a mission-matched, long-lasting team who will deliver phenomenal results. Carol Rowland has spent 20 years in the development field. First as a consultant for 10 years with one of Omaha's oldest firms, specializing in capital campaigns. Then as the vice president of the St. Luke's Health Care Foundation in Cedar Rapids, IA, where the team raised nearly $30M in five years. In 2011, she left the Midwest to join The Suddes Group | For Impact where she has served as a coach for a number of organizations in fields as diverse as health care, higher education, the arts to youth camps and social service groups. She makes her home just south of Nashville. Whether your nonprofit is a one-man shop or is supported by a full complement of seasoned fundraising professionals, a successful development program depends upon an effective major gifts effort. A major gifts program depends upon a strong collaborative partnership between staff and well trained, highly engaged development volunteers. The key is mobilizing and motivating your team of volunteers to make asks. Trends in both fundraising and the economy continue to warrant a greater emphasis on major gifts from fewer individuals. Capturing the attention of individuals and organizations who can make a significant financial difference demands well-conceived strategies, a compelling case for support, the "best" individuals involved in an ask, and a recognition and communication program to sustain these gifts in the future. The short term result of a well-organized, comprehensive major gifts effort is raised expectations by the organization and donors on the significant impact of large gifts. The long term result is a broader view of philanthropy, which matches your organization's needs with the donors’ interests. This session will help to prepare your volunteers to “Make the Ask” through presentation covering current trends and best practices, an interactive case study and question and answer. Patti Lyons is Executive Partner of Pride Philanthropy, a fourth-generation fundraising consulting firm currently celebrating its 90th year of successful support of nonprofit organizations. Begun in 1925 and originally based in Aspen, Colorado, Pride has continued to evolve over nine decades and now has staff, Executive Board members, a Board of Advisors and clients throughout the country. Patti served as Foundation Director for the Whitfield Healthcare Foundation at Hamilton Medical Center in Dalton, Georgia, from 1984 until 1988. For the last 26 years, she has been co-owner of the firm, with an emphasis on major gifts, prospect assessment, and strategies for fund development staff and volunteers. Patti has been a motivational speaker for numerous non-profit boards and her organizational and motivational skills have brought a high level of success to her many clients through the years. 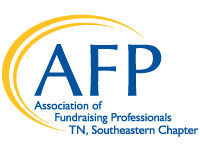 Patti is a long time member of the Association of Fundraising Professionals (AFP) and a graduate of the University of Georgia School of Journalism. She serves in a volunteer leadership role on two nonprofit boards in her home community of Roswell, Georgia, and remains very engaged in the Chattanooga philanthropic culture. Recent regional Pride clients include Hamilton Medical Center, Erlanger Medical Center, Children’s Nutrition Program of Haiti, and Chattanooga History Center. Explore the meaning behind the concept of a "Philanthropic Culture," and learn what it takes to create, build and sustain one. If you are an Executive Director or a Development Officer, this session will help you shape the values and ethics that define a strong culture of philanthropy. discussions will give you specific approaches to work with your boards, your leadership staff, your volunteers and even your front-line staff. This session is delivered by the author of the lead article in the recent AFP publication "Advancing Philanthropy." Be inspired by Karla's keen sense of the donor environment, a propensity for challenging assumptions, a principled participative leadership philosophy, and her unique classroom levity. Karla is an organizational consultant with more than 35 years of professional nonprofit leadership. Her firm, THE WILLIAMS GROUP, has assisted over 250 nonprofits to develop strong donor focused cultures. Karla penned the first article on the importance of Creating a Philanthropic Culture, published in Contributions Magazine. She is the author of two highly-acclaimed books; Donor Focused Strategies for Annual Giving, a fundraising classic, and her newest book written for executive directors, Leading the Fundraising Charge. As a teacher, Karla has helped shape the fundraising profession while inspiring colleagues to see fundraising as a calling. She currently serves as adjunct faculty with The Fundraising School at IUPUI; the Masters Program in Philanthropy and Development at St. Mary's University of MN; the Fundraising Certificate Program at the University of St. Thomas Center of Business Excellence, and she is the Faculty Director and Founder of the new Leadership Gift School, Institute for Philanthropic Leadership in Charlotte, NC. Over the years, her work as a consultant, teacher, author and speaker has inspired organizations across the country to accomplish unlimited goals with limited resources.